The point of this book is the illustrations. 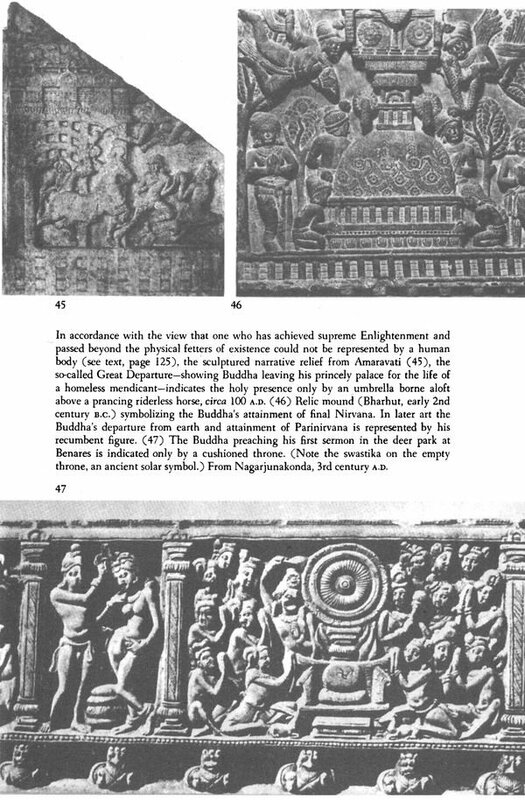 There are forty-eight pages of these, all in monochrome, but well and imaginatively chosen… The text is well written and free from inaccuracies, its emphasis being, as it should be, on iconography. 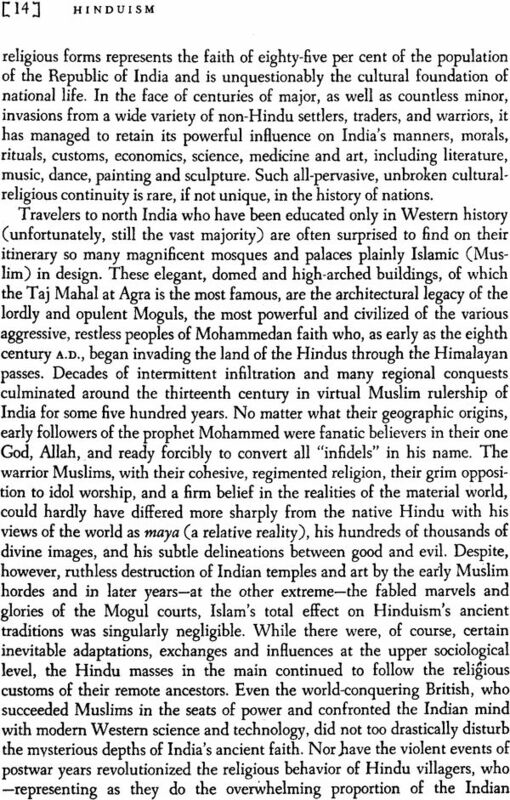 The author has, moreover, succeeded in fitting all that is essential to the study of these complex religions into the very limited space at her disposal. 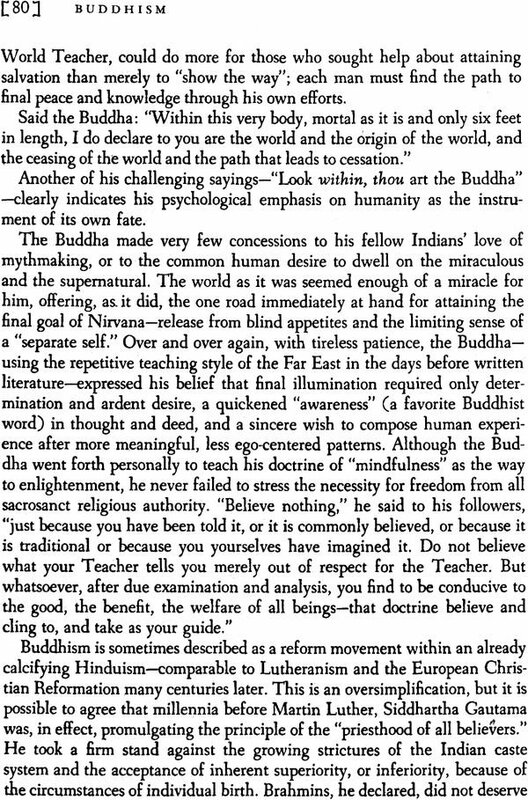 My reason for undertaking the writing of a book on Eastern religions, designed for the general reader, was essentially a simple one. There has never been a time in world history when East-West relationships have been of such intense, immediate concern to all mankind. For hundreds of millions of Asians their religion-no matter what form it takes-is the most vital concern of their daily lives, very far indeed from a mere one-day-a-week observance. Yet it is undeniable that the average Westerner knows very little, if anything at all, about the powerful spiritual motivations, religious convictions and ways of worship of the people who live on the other side of the globe. In the past, many sincere and dedicated Westerners have gone out to Asia to face with admirable courage the severest hardships and dangers in order to spread the word of Christian beliefs and customs. 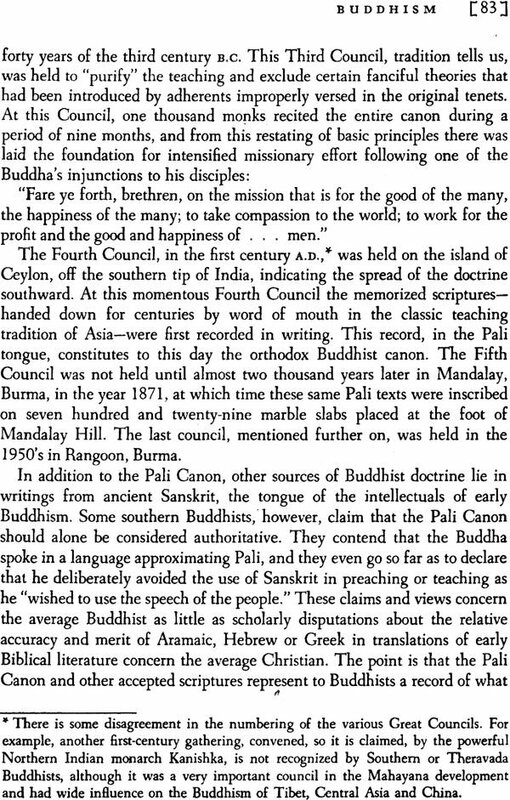 Since these missionaries were, on the whole, judging from the record, received politely, listened to and patiently tolerated, it does seem now no more than the smallest return courtesy to make increasing attempts to understand certain beliefs about God, man and the universe that have been the basis of brilliant cultures and superb art in the long, rich and complex history of Asia. A quickened Western understanding of the mysteries that rise from the deepest level of mankind's common life seems acutely important today when East-West confrontation on more obvious levels grows hourly of greater concern to everyone alive. Although my reason for undertaking a layman's explanation of three Asian religious philosophies, and the arts that grow from them, was simple and direct, I think it fair to add this does not imply that writing such a book was equally simple. Of Hinduism, for example, it has been often and truly said that nothing can be asserted about it that cannot also be denied. 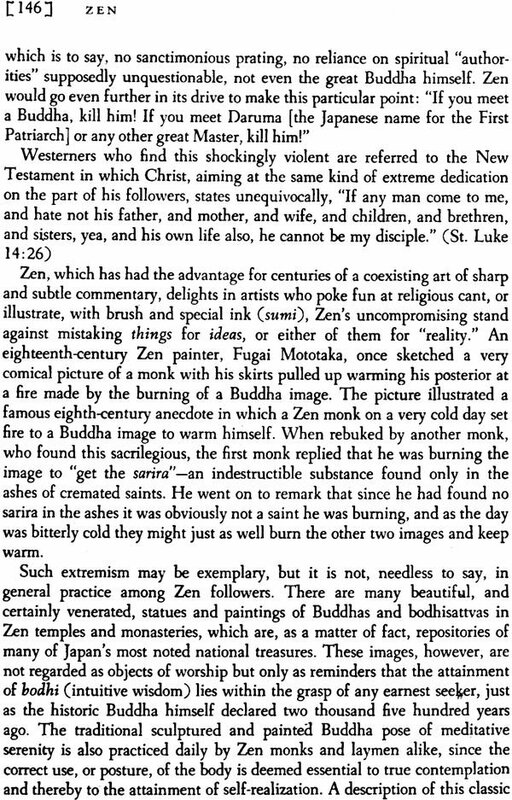 What is more, the Christian vocabulary and the vocabularies of Eastern faiths by no means dovetail with neat exactitude. A Westerner cannot write about religion without making use of such basic terms as God and the soul. The word God, signifying the creator of man's universe and the supporter of strict moral law, though relevant in writing of Christianity-as it would be of Mohammedanism or Judaism-does not, however, quite fit the concepts of a Supreme Being or First Cause in either Hinduism or Buddhism. 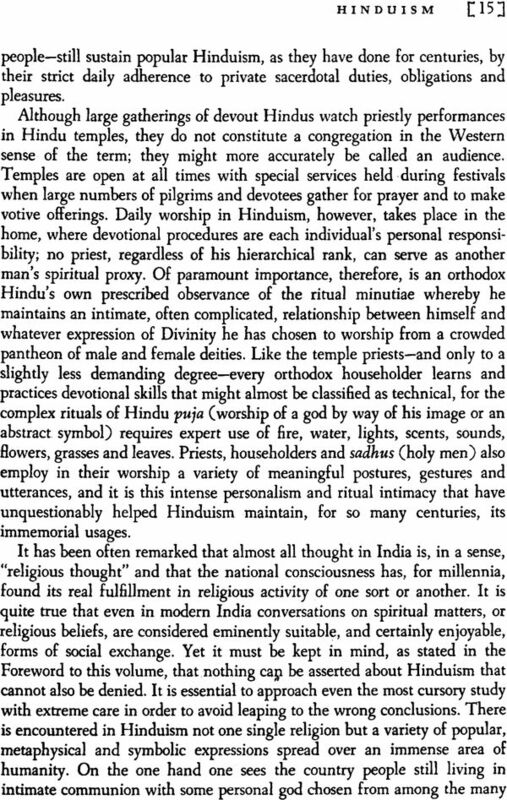 Where Hinduism appears able to manage, with dazzling adroitness, to combine the worship of innumerable gods and goddesses with a seemingly paradoxical monotheism, Buddhism considers the concept of a Creator of the Universe so far beyond the scope of man's limited powers of comprehension, and so essentially irrelevant to following the Buddha's ethical Middle Way and training in "mindfulness," that it prefers to keep silent on the subject. As for the soul-Hinduism holds that there does reside in every man a spark of the divine, known as the atman, and that this spark can, by methods both mystical and specific, rejoin its Divine Source-infinite, immutable Brahman-while still on earth. 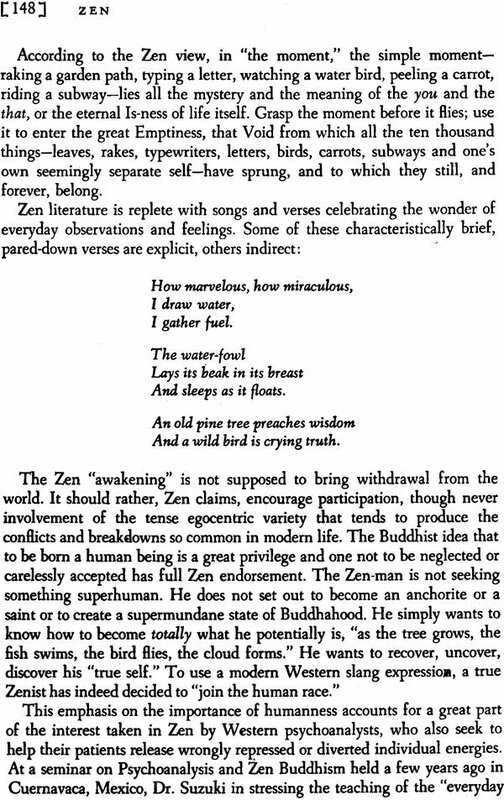 Buddhism, in general, holds that there is no such thing as an individual ego, personal self, or soul-in our sense of the word-but only an ever- changing, forever-in-Aux "aggregate of energies." Both religions, however, with varying degrees of personalism or abstraction believe in the Law of Karma or "As ye sow so shall ye reap," and this Law extends itself through more lives than one, as expressed in the theory of re- incarnation, basic to both faiths as it is to almost the whole Eastern world. Yet with all the innumerable differences in viewpoint or emphasis-not only between East and West but between Eastern religions themselves and even among their various sects-it is evident that all seekers of salvation, deliverance, Nirvana, Heaven, moksha, samadhi, satori, truth, or even merely "meaning," are obviously working with the same materials: unknown man and his unknown universe. 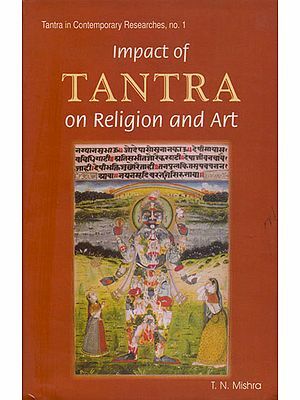 During the writing of this book, my own search for personal understanding of Eastern religious thought and its related art forms has been considerably ex- panded. I have come to see with increased clarity, and without forcing all possible parallels, that there does exist a larger number of paths of connection between Eastern and Western points of view than I had seen before. 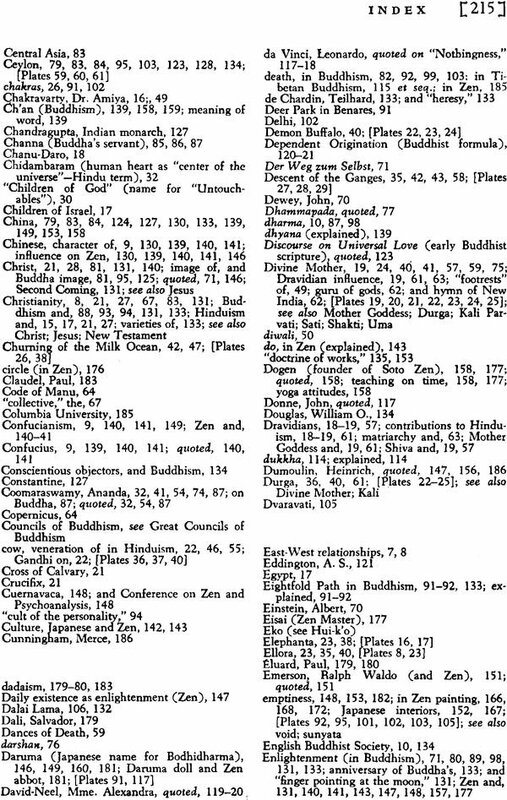 The range of interests that have become so much a part of Western thought in the present century-physics, astronomy, astrophysics, psychology, psychoanalysis, psycho- therapy, even the new so-called "science" of mythology-are offering us fresh clues every day to clearer comprehension of ancient beliefs and concepts born long ago in the profound depths of Asian consciousness. 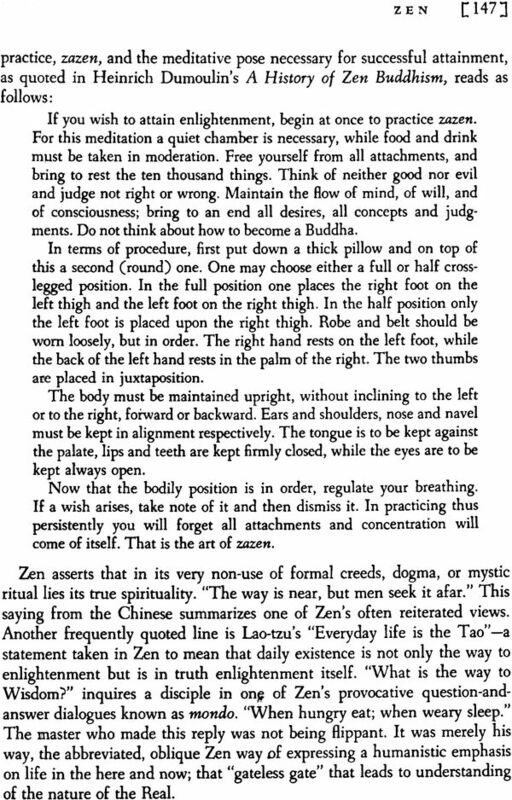 It is wise, however, not to press too hard for similarities; it is better to allow one's mind, rather, to be stimulated by the significant differences. Perhaps, indeed, the reader might bear in mind the remark once made by the great Vedantist Swami Vivekananda, who during his first trip to the West late in the last century made such a profound and lasting impression on all who met him and heard him speak. 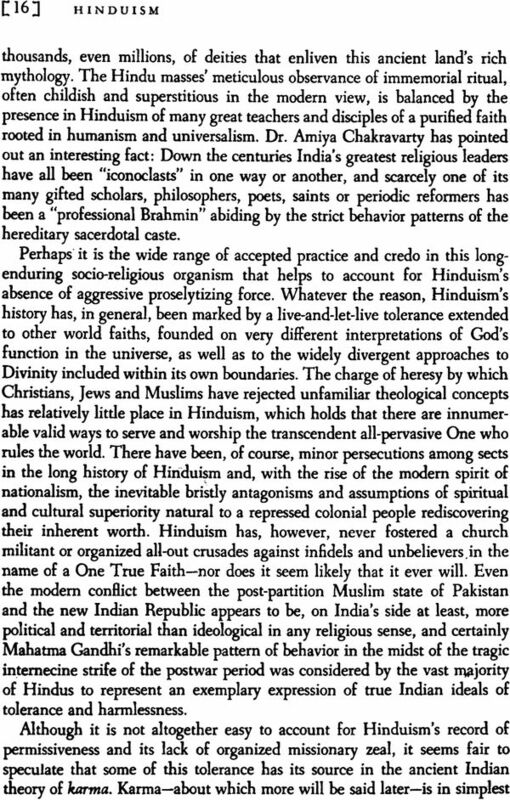 Vivekananda said: "I accept all the religions of the past and I worship God with every one of them. Can God's book be finished? Must it not be a continuing revelation? Difference is the first sign of thought. I pray that the sects may multiply until at last there will be as many sects as human beings." 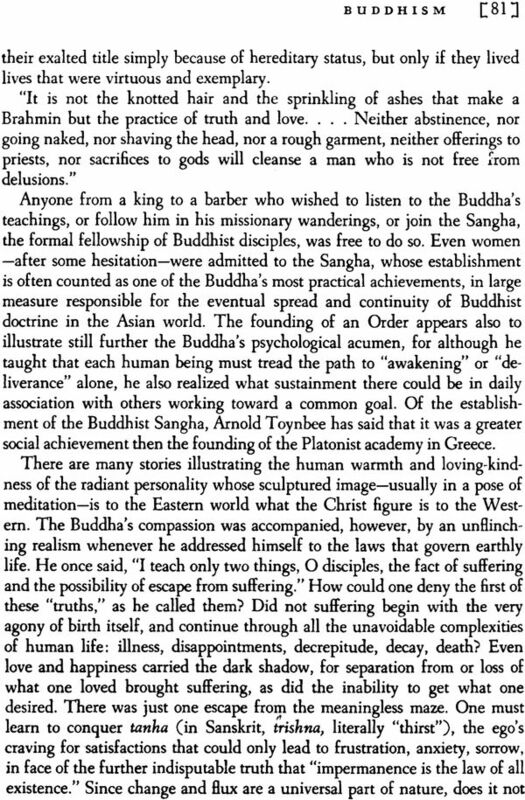 If this seems an exaggerated and even alarming point of view, perhaps the advice given by Edmond Taylor in his useful book Richer by Asia could prove helpful. 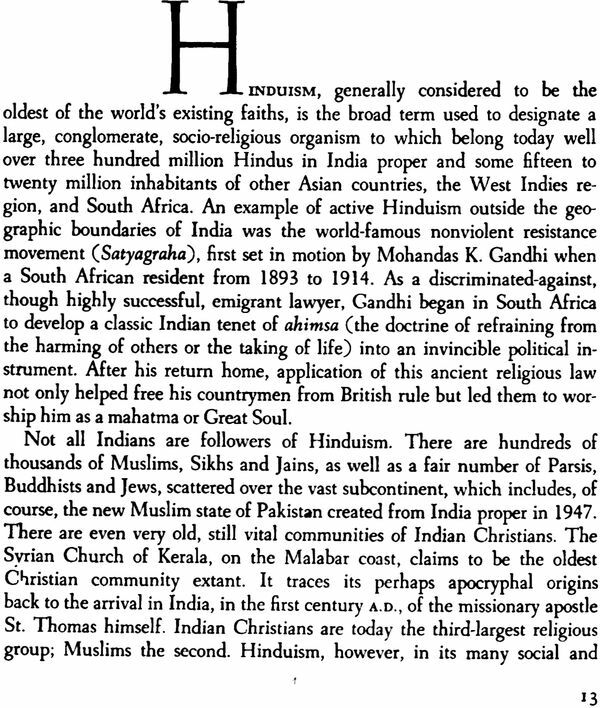 Taylor remarked that after an interest in Eastern religion had overtaken him during war years in India, Ceylon and Japan, he determined in his study of simple Buddhist and Hindu religious experiences to try as best he could "to feel rather than think them." 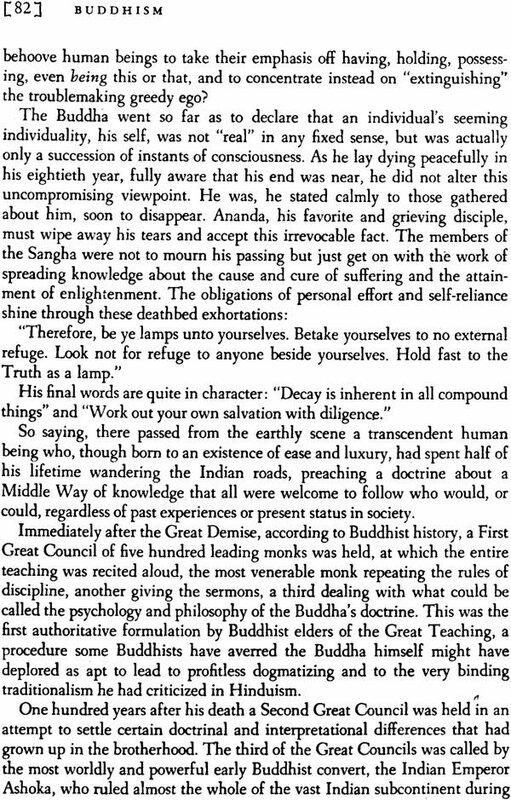 Carl Jung, whose psychological insight and wide scholarship have done so much to create more viable relationships between Eastern and Western ways of thought, once expressed some of the feeling with which I have ended this work of the past few years: "The wisdom and mysticism of the East have, indeed, very much to give us even though they speak their own language which is impossible to imitate. They should remind us of that which is familiar in our own culture and which we have already forgotten, and we should direct our attention to that which we have pushed aside as insignificant, namely the fate of our own inner man." One final note on the absence of diacritical marks in the following pages. 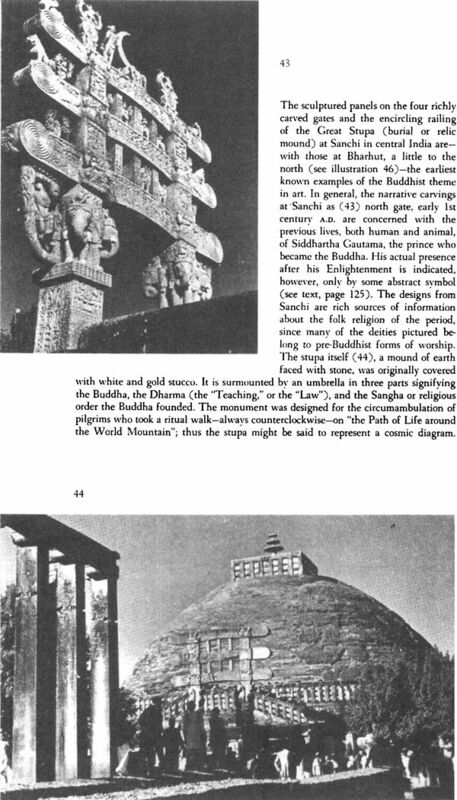 In works of original scholarship, words from Pali or Sanskrit arc given diacritical marks to distinguish between vowels and consonants represented by the same English letter. 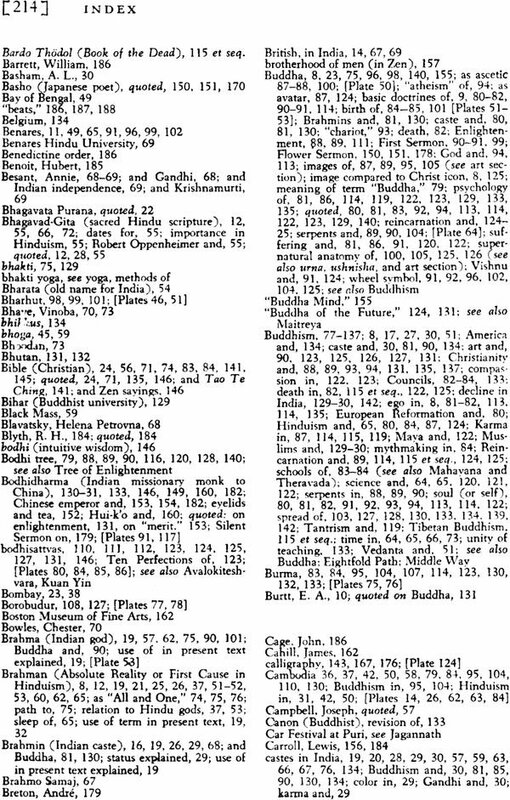 Since this book is, however, aimed at a general readership, there seemed little reason to add unfamiliar marks to already unfamiliar words, as for instance, in the names of the Indian gods, which are spelled approximately as pronounced-that is, Shiva and Vishnu instead of Siva and Visnu, Also where, as in the two main schools of Buddhism, there exist two words describing the same thing, one in Sanskrit, one in Pali, I have used what seemed to me to be the more familiar of the two: thus the Sanskrit Nirvana instead of the Pali Nibbana; the Sanskrit karma and dharma instead of the Pali kamma and dhamma; but the Pali anatta (no self) instead of the Sanskrit an-atman, and the Pali tanha (craving or thirst) instead of the Sanskrit trishna. 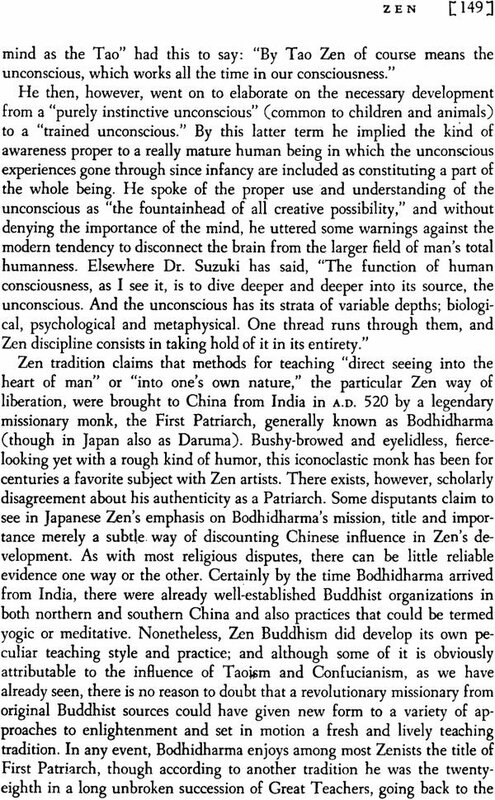 In this procedure I have followed the example of such authoritative writers on Buddhism as Professors E. A. Burtt and Floyd Ross, Christmas Humphreys, head of the English Buddhist Society, and a number of others who have written books in this field designed for general readership.